Discussions Magazine Music Blog: THE MOTORS/The Virgin Years: SPAZ reviews the 4CD box set! THE MOTORS/The Virgin Years: SPAZ reviews the 4CD box set! Any music connoisseur could easily fill in the blanks of that sentence with at least a dozen band names and they’d all be accurate. However, today we’ll be discussing The Motors, the British Rock ‘n’ Roll band formed from the ashes of Pub rockers Ducks Deluxe. 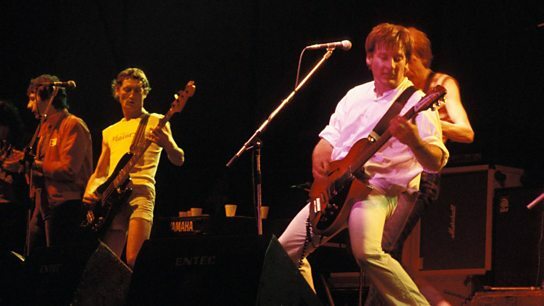 Singer/songwriters Nick Garvey and Andy McMaster were the leaders of The Motors yet the band may be best remembered in the U.S. for being the springboard for guitarist Bram Tchaikovsky, the singer/guitarist who released the Power Pop favorite “Girl Of My Dreams” a year after he left the band. 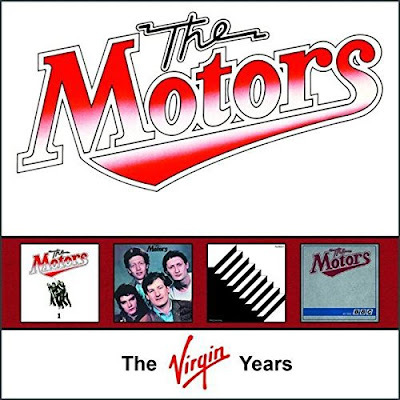 One of the fascinating things about The Motors is that they released three very different albums in their short career yet still managed to retain a unique sound thanks to the voices and quirky Pop smarts of Garvey and McMaster. From straightforward guitar-fueled Rock ‘n’ Roll to bombastic Pop with Prog-like keyboard flourishes, The Motors never wore out their welcome because they never stood still for too long. The 2015 four CD box set The Virgin Years contains all three of their albums – including loads of bonus tracks – plus a bonus CD containing rare BBC recordings from 1977. If you’ve never explored the band before, then you’ve got almost everything here in one go. (For the record, the only thing I can think of that is missing is the shorter 7” version of the “Picturama…” b-side but more on that track later). Their debut album, The Motors 1 (1977) is no-nonsense Rock record with some classy tunes, Punk-like energy and a large heap of sweaty Pub Rock thrown into the mix. On the surface, the album may sound like an homage to Status Quo’s heads-down Boogie but The Motors were far too clever to be Quo-lite. “Dancing The Night Away,” “Cold Love,” “Emergency,” and “Freeze” are prime examples of the band’s ability to write catchy tunes AND heavy Rock riffs that left their mark on your brain. Like Squeeze’s Difford and Tilbrook, Garvey and McMaster’s voices were distinct when they were singing in unison/harmonizing. The album’s eight tracks are joined by an additional 5 tracks including non-album b-sides and single edits. Their second album, 1978’s Approved By The Motors, found the band refining their sound. There were still a few tracks that traveled down the same path as the debut – “Mama Rock ‘n’ Roller” and “You Beat The Hell Outta Me” (a b-side from the first album) come to mind - but this album upped the melodic ante without catering to the New Wave scene that was in full swing at the time. The bona-fide hit single “Airport” even featured keyboards yet they managed to avoid slipping into Synthpop mode - the live drums/bass/guitar certainly helped. The Pop-tastic single “Forget About You” should have been a massive hit in every corner of the world. Other highlights include “Soul Redeemer,” “Breathless,” “Dreaming Your Life Away” and the lovely “Today.” On top of the original album’s 10 tracks are five bonus tracks including the stunning eight-minute “Picturama/The Middle Bit/Soul Surrender,” which may or may not be the band’s attempt at creating their own suite of songs similar to side two of Abbey Road. (Tchaikovsky would later record his own version of “Soul Surrender” on his third solo album Funland.) Oh, the single version of “Today” is included and sounds even more lovely with added bits and bobs. A great album made even better by the bonus material. The fourth and final disc – At The BBC – features seven previously unreleased live tracks from 1977. Judging by these tracks alone, the band’s early live shows must have been quite a treat. These recordings are solid and sweaty. Each of the four CDs are packaged in mini LP sleeves and housed in a clamshell box alongside an informative booklet containing liner notes and scans of original memorabilia and record releases. Rev up and get this one ASAP. And, hey - buy one for a friend!